The PNC Financial Services Group Inc. (PNC) reported total revenues of $4.3 billion for the third quarter of 2018, up 6% compared to the same period last year. Net income attributable to common shares was $1.31 billion or $2.82 per share compared to $1 billion or $2.16 per share in the same period last year. The result beat analysts’ consensus estimates of $2.73 in EPS but missed on revenue of $4.35 billion. Shares of PNC have a 52-week trading range is $130.46 to $163.59. Net interest income grew 5% while non-interest income grew 6% during the quarter compared to the prior year period. Net interest margin increased to 2.99% from 2.91% last year. 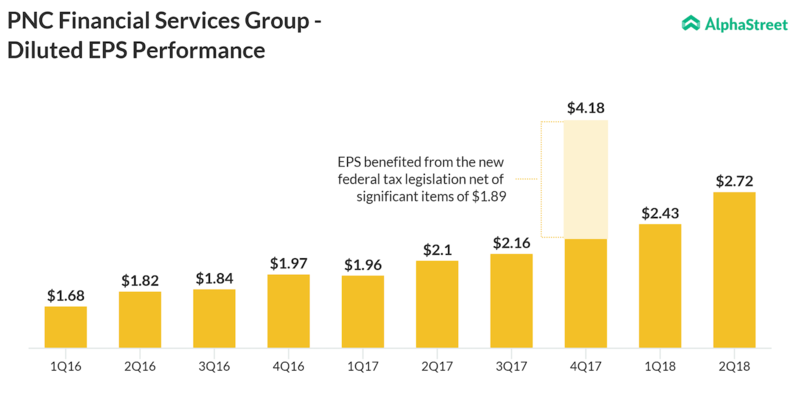 Asset management revenue grew $65 million, reflecting benefits from the lower federal statutory income tax rate on BlackRock earnings and higher equity markets. Average total assets were $377.9 billion in the third quarter. Average loans grew 2% to $223.3 billion while average deposits grew 1% to $262.5 billion. Profit rose 24% to $1.35 billion, from $1.09 billion a year ago. Earnings per share of $2.72 beating the $2.58 per share expected by analysts polled by Thomson Reuters. PNC is the first major regional bank to report second-quarter earnings. PNC benefited from higher interest rates, allowing it to charge more on loans. Net interest income grew 7% from a year ago. The bank's net interest margin also grew. Total deposits were up 2%. PNC decreased the amount it set aside for possible credit losses. Commercial lending grew 3% from a year ago. This business is a key revenue driver for Regional midsized banks like PNC. Consumer lending grew 1% from a year ago. The banking sector received a boost earlier in the year after the largest U.S. banks passed Fed stress tests and were allowed to raise dividends and share buybacks. The Fed as it raise rates is helping banks' finances. Since Donald Trump won on Election Day has been a huge run higher on PNC and the other bank stocks. Auto and student loans also overhang the banking and finance sectors. The bank rally had been fueled by expectations for easier regulations including a possible repeal of DoddFrank and infrastructure spending. The new surge in home prices has also buoyed optimism for the mortgage business and banks profits thereto.